I quite liked the original Top Gear, for a bit. But after a while the contrived stunts, the carefully rehearsed witty banter and lack of any actual information about cars beyond the price and interior finish of models selling for more than the GDP of Finland began to grate. So when Clarkson got the boot, taking his pals Spinner and Paddlefoot with him, the producers had a golden opportunity to get back to basics and make a show about cars. But they didn’t take it. 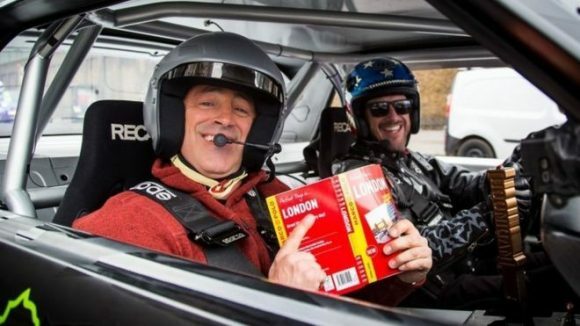 The all-new Top Gear is exactly the same as the old one – there’s one less presenter but the stunts are just as unlikely and the ad-libbed repartee just as tightly-scripted. Even the throw to the Stig – “Some say he’s…” – is the same. The only visible difference – apart from Chris Evan’s fake hairline and Matt LeBlanc’s faker teeth – is that the show smacks of being done on the cheap, relatively speaking. True, the Clarkson legacy of largesse was starting to pall, but if you’re going to stay in the same rut you need the same sized budget. 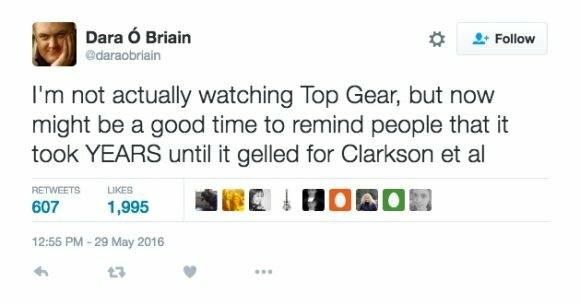 Irish comedian Dara O’Briain tweeted after this first show aired: “I’m not actually watching Top Gear, but now might be a good time to remind people that it took YEARS until it gelled for Clarkson et al” — which is probably correct, although they did start from scratch. Maybe Evans and his actor mate Joey should have wiped the slate clean and start over as well, because as it stands, Top Gear is about as fresh as a Trabant’s exhaust. “It’s not a disaster. It’s polished, the stunts (so many of them!) are fun, the tweaks are improvements. But it is a shame there wasn’t more in the way of refreshing the show itself. It’s just new people doing same old same old.”– The Guardian. “The studio sequences were lively, if also slavish to the old style. There was no sign of the reported lack of chemistry between Evans and LeBlanc, and while the former worked the crowd like the polished media pro he is, the Friends star added some much needed sardonic grunt, instantly justifying his choice as co-host. It’s a partnership that should improve with time.” — The Telegraph. “It is all pointless, hackneyed and tired. Yes, I realise that is like Top Gear always has been, but what spark of originality there once was is now missing. They don’t seem to be having as much fun playing with cars, this new lot.” — The Independent. “It deserves to prosper because boys need shows about cars, and Evans and LeBlanc pummelled the patient’s chest vigorously. It not only sat up in bed but sprinted round the rescue ward. It just didn’t look right.” — The Times. It was watchable, but too polished, too similar to the previous format. More like watching the American or Australian versions. And why does Chris Evans have to shout all the time? I get he’s excited, but really? It’s like the BBC have fitted retreads instead of putting new grippier tyres on it. Not sure this incarnation will get any traction. First two episodes were total rubbish, the online extras only a little less so. They should have let TG die.